The Tulsa Foundation for Architecture's first modern home tour attracted approximately 150 attendees to tour six Lortondale homes. Beginning in 1954 about 250 low-slung modern homes were built on, what was then, the outskirts of East Tulsa. Today enthusiastic owners are restoring, renovating and repairing previous "remuddles" that were not kind to these Mid-Century classics. 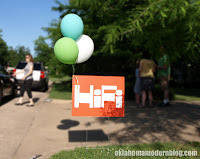 The tour, entitled "Living in Hi Fi", focused on some of the best examples Lortondale has to offer. Homes featured on the tour ranged from extensively modified to nearly untouched time capsule. Lucky attendees got to see some of the most creative design Tulsa has to offer. Some of the tour attendees were former owners returning to visit their old neighborhood (below). We thoroughly enjoyed this inaugural tour. This annual event promises to be a "do not miss" for fans of modern architecture and design. 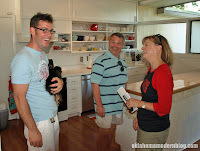 For more photos from the tour check Moderntulsa.net.